This isn’t a blogpost about cooking. It’s a post about socks. Specifically about the four dozen socks in my house that do not match at all, and why every single time I wash socks, half of them disappear. It’s about why neither of my kids can ever find socks that match, or fit, in the morning scramble, even though I am eternally washing said socks. I can’t be the only mother out there in this great land with sock issues. The other night I dumped a huge load of clean laundry onto the living room floor to fold. I threw the socks into a pile to sort later. When I got to the socks I laid them all out one by one. There were, by my count, 14 socks. Out of these 14 socks I was able to pull two (2) matching pairs. To use the parlance of our times: WTF. This pile of ten unmatched socks was a small fraction of the total number of socks in the household. I buy a 12-pack of white crew socks for boys and girls every six months, it seems, and they promptly disappear without trace, probably to where all the pacifiers ares still hiding. I know there are socks in every room of the house; in the closets, under the couches, hiding in the laundry room, in various drawers and very rarely the drawers they’re meant to be in. If I could muster the courage to check underneath beds I’m sure I’d find great infestations of socks, and probably mutant offspring. This sock issue has recently hit critical mass. There are NO socks, apparently, to be found that either A.) fit or B.) Match. My kids being my kids, matching is not such an issue. They would like comfortable socks without holes that fit their feet, however, and I agree that is not too much to ask. Recently my daughter held up a sock that might fit a 3-year-old. She is 15 and has bigger feet than I do. I could only shake my head. But the real bottleneck for me is when I start fretting over what to do with this little sock. It’s a perfectly healthy little pink striped sock. Maybe I can put it aside and search for its mate and then give them to the mom of the 6-year-old twins next door, or the 3-year-old across the street. Or…even better…maybe I can make it into a sock puppet. I did this once or twice when the kids were very small, and they were thrilled with their little sock puppets with button eyes. And didn’t I just feel like a real Mom? And so Martha! and so green, re-purposing like that. Good mommy! But no, this is when trouble starts. Am I realistically ever going to find the mate? Am I realistically even ever gonna look? No. And sock puppets. Really? I did that once just to prove I could. So I would never have to make another effing sock puppet. Again. So I do nothing. And the socks breed on, unfettered by my better intentions. The boy recently suggested a solution. I wonder if this thinking is coming from all the video games he plays or the science fiction books he devours, but either way I had to agree it was a fairly sound plan. End it all and start fresh. Very Darwinian. And so today I hardened my heart and went through the house without mercy. Every sock was plucked and put into a laundry basket of doom. 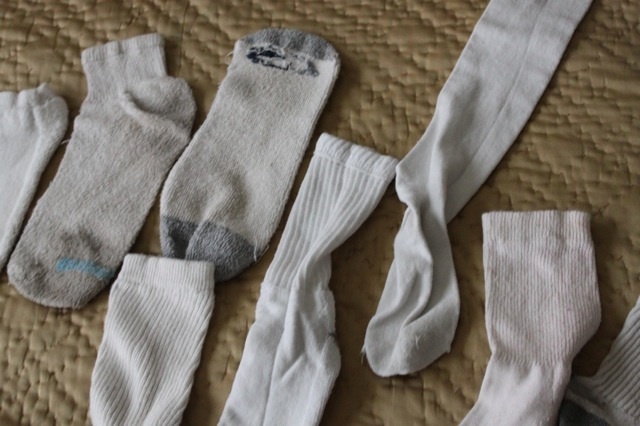 All socks not already paired were pulled screaming from drawers, dragged out from underneath beds, coerced from dark corners in closets, and put into the basket of the damned. Even that brand new looking green bootie sock was thrown out. All’s fair in love and footwear. I retained the black concert wear. Those socks are under my imperial protection, and so remain safe in pairs. In my drawer. Now there is one 12-count packet of new boys cushioned crew socks and one 12-count packet of colorful bootie socks for the Drama Teen, who doesn’t care at all what her socks look like as long as she has some for underneath her Doc Martens. Let us see what happens to the household sock situation now! Apparently, your house is one of the points that form the Bermuda Socktangle. I know this because my house is one of the other points. Socks come in and then disappear, NEVER TO BE SEEN AGAIN (cue creepy music). A friend of mine’s husband took their washing machine apart and found a dozen or more socks stuck to the outside of the drum. Obviously this accounts for SOME socks, but could not nearly account for all the socks that have disappeared in this house. There is something more SINISTER going on. I finally became convinced that it was the work of aliens. Aliens with very cold feet. Or tentacles. Or whatever. Either that, or it’s a deep plot by sock manufacturers. They have created these socks that must dissolve after a few wearings. They put an odd one in now and then that does not dissolve, just to throw us off the track. It’s a plot. A plot to get us to buy more socks. Don’t throw them out. Tisk…tisk… We keep them under the sink and Natalia uses them as a dusting mit when she cleans the furniture in her room. Put the new sock pairs in a garment bag to wash, or keep them paired, together tied with elastic hair band in the wash and dryer. Presto. I’ve got a few (8 or so) in the drawer right now, waiting…..for their soul sock to come back to them. this blog had me laughing out loud all to my self!! I could have written it (but not as well). I had a 14 year old steson and a 8 year old girl. I repeatedly keep finding this lonely, little pink baby sock that my daughter used to wear when she was a baby. This, as it did to you, threw me into a tailspin. How could I possibly throw out this lonely sock? I don’t remember what I did with it but I think I just threw it back into the laundry. My house is also the Bermuda Socktangle!! Not only do I have lonely single socks from my house but I also have single socks from my stepson’s mother’s house! How did that happen? I’ve actually given up. I put all the lonely socks in a bin and go through the bin about once a month. Keep up the great blogs!! And thank you for the well needed laugh!! I’m glad you liked it, Michelle! I seem to have hit a nerve with this one…and I’m glad I’m not the only one with a sock problem…:-) Thanks for reading! I also, could have written this. I never heard the thing about the outside of the washer drum. But, folks, I am in the Guinness Book of World Records for having the most unmatched socks in my house. We occasionally have a “sock party” where everyone brings all their unmatched socks from their rooms and we throw them all together and then try to match them up. I am talking about a pile of socks big enough to be mistaken for a mud hut or an igloo. I WILL throw away a tiny baby sock, since it has two strikes against it, no one can wear it anymore, and it has no mate. But I just KNOW all the mates of the adult socks will show up the minute I throw them away, and I think that would push me over the edge. So the mateless sock pile just grows and grows. ..mistaken for a mud hut….BWHAHAHAHAH!!! I use to have a dog when I had less children and used the extra socks to stuff one large mens knee sock, tie at one end, voila chew toy. Dogs love it and it’s easy to wash. Currently though I keep a stack on a shelf above the washer for those poor little fellows that never find their mate. I’ve yet to throw them out but every couple of months I do throw them on the washer to match them up. Eventually when one sock gets a hole I don’t feel bad chucking it and going in search through the stack to find a suitable partner. Too funny! But I am soooooooo glad I’m not alone! I end up with a very large laundry basket by the end of the year of unmatched socks! I even wait for my mother to come and visit, before we go on a sock hunt! That way she can feel good about matching them, (That happens to be the one thing I can not stand about the laundry, even my kids don’t like matching. By the end of my mother’s visit each year, somehow grandma always winds up starting their sock adventure over. I laughed so much I almost cried. It was almost as if I was reading about my own house! You’re glad? I’M GLAD! So nice to know I’m not the only totally dysfunctional mom out there…. very cute! I have a basket of socks without mates. You have given me the courage to bravely toss them, because they’re never going to see their match again. I too use them to dust our even stuff toys with….but maybe the true answer could be found if we e-mail bay the suckers!! I am impressed by the number of people who actually dust, let alone with a lone sock! I, too, am saving that baby sock for the day when I find its mate. I don’t know what I’ll do with the pair when the two are reunited after all of these years, probably throw them out together, or give them away. We have made “rice socks” and are quite thrilled with them. You don’t have to be Martha to do this. Pour some rice into a sock. Tie the sock closed with some yarn (sewing was way too much trouble). Microwave for 2 minutes (size of sock will determine cooking time). It is like heaven in your bed keeping your feet warm, or draped over your aching neck (which is in this state because you were slaving over the stove all day, right? ).